Scoil Cholmcille through this policy aims to help all those involved in our school community, children, staff and parents, in developing positive and responsible attitudes to eating and to appreciate the contribution that good food makes to health and discipline. Cans and glass bottles are not allowed for safety and litter reasons. All classes will receive lessons on healthy eating during the school year. 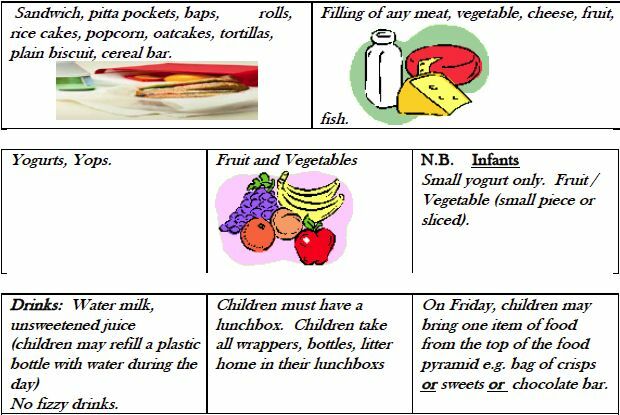 Teachers, SNA’s and older pupils will assist young children with their lunch. Staff of Scoil Cholmcille will provide positive modelling and supportive attitudes to encourage healthy eating. Healthy Eating Guideline will be reviewed and a Healthy Eating Awareness week will be held during the year.